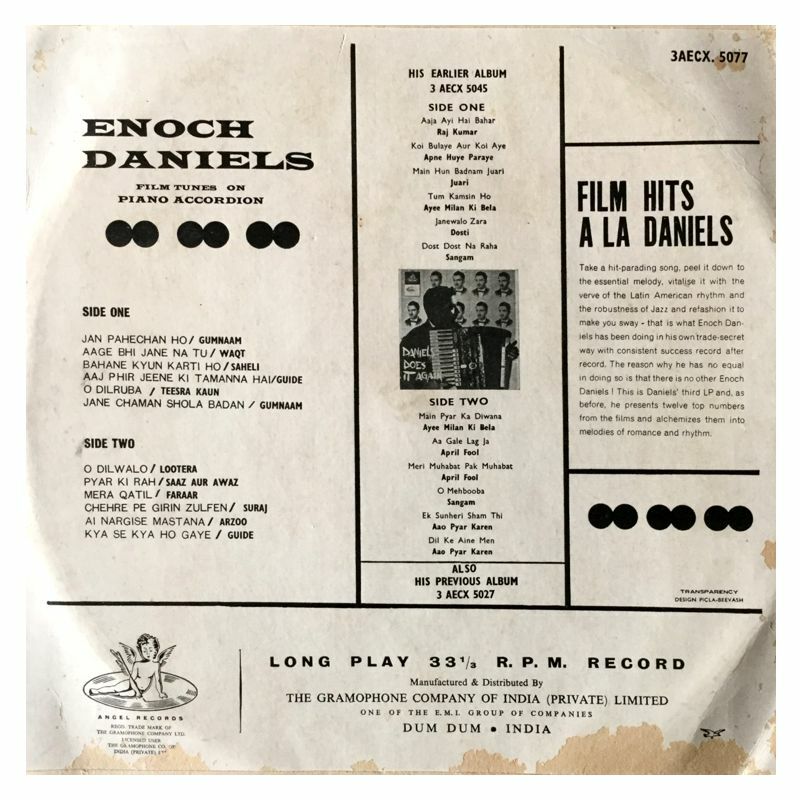 'Enoch Daniels' - the very name triggers a whole range of bright variegated tunes on LP's that have continued to shine and shimmer, diamond-like over so many years. 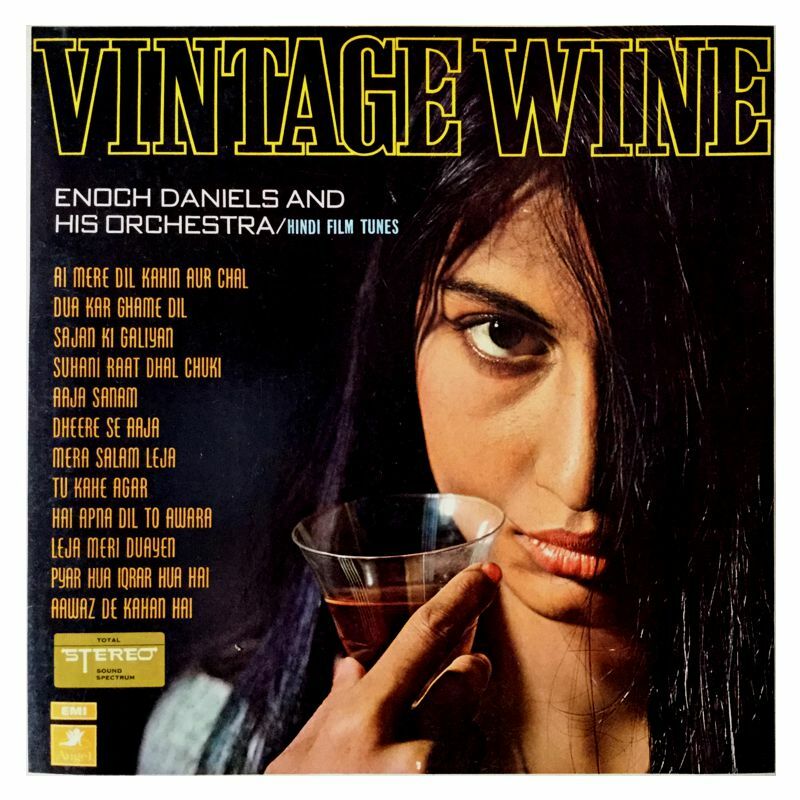 First it was Vintage Wine. 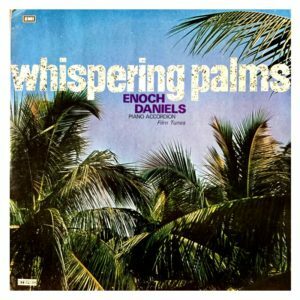 Then came Eventide Echoes, to be followed by Whispering Palms and Fire is Fire. 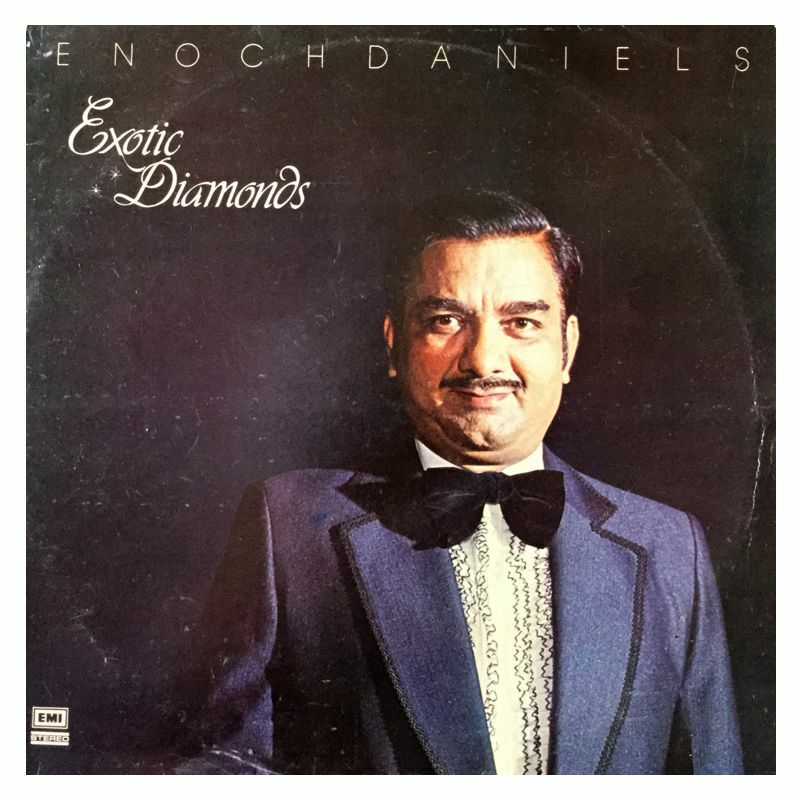 Now comes another gem of his creativity, aptly named Exotic Diamonds and Enoch has dug deep to unearth them and give them new facets. 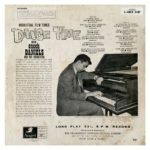 Like his previous recorded hits, the 11 compositions heard on this disc have been inspired by film tunes that were the rage of the forties and the fifties. 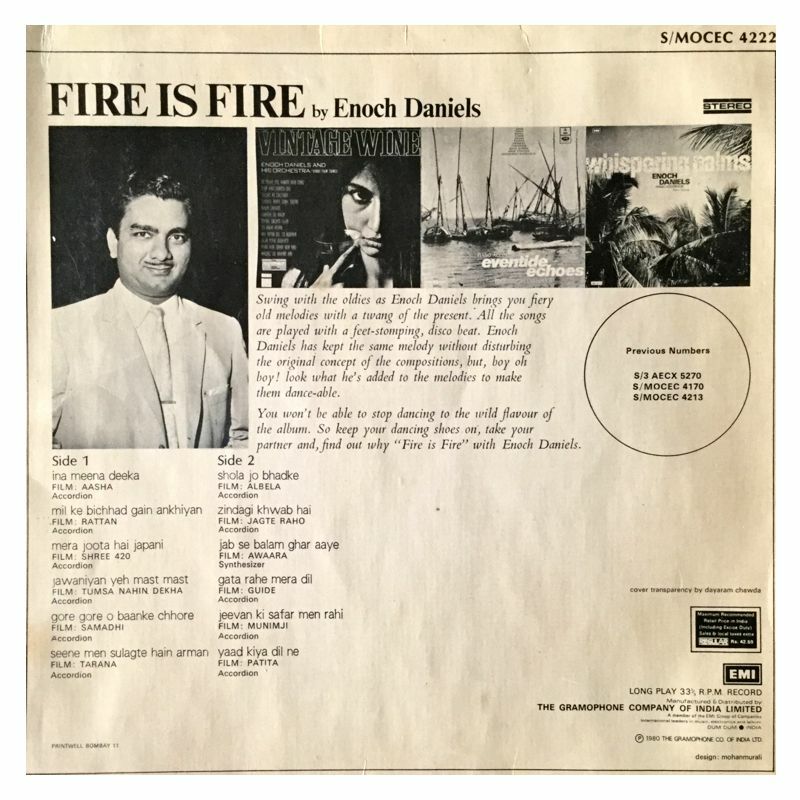 The songs, time-tested and and evergreen still have the power to haunt our ears. 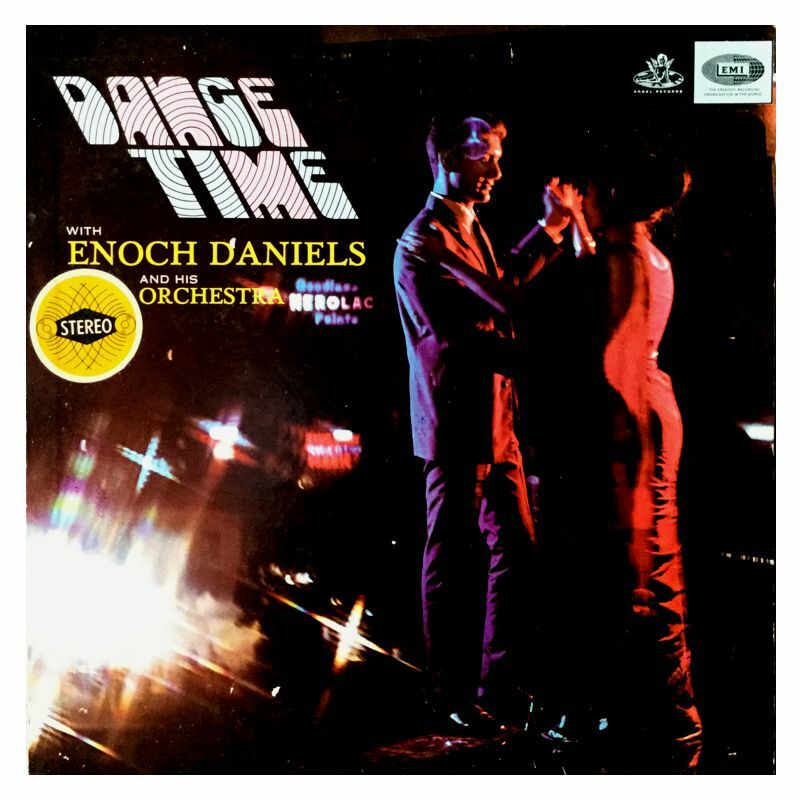 Enoch Daniels' distinction lies in his savoir-faire in keeping the individual mood of these songs untouched. The 8-track stereo effect of the new HMV studios lends to these tunes a new freshness, a new glow. The instruments ensemble includes western media as well, but the style employed is basically percussive. Hence the typical modern character of the repertoire. Swing with the oldies as Enoch Daniels brings you fiery old melodies with a twang of the present. 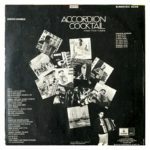 All the songs are played with a foot-stomping disco beat. 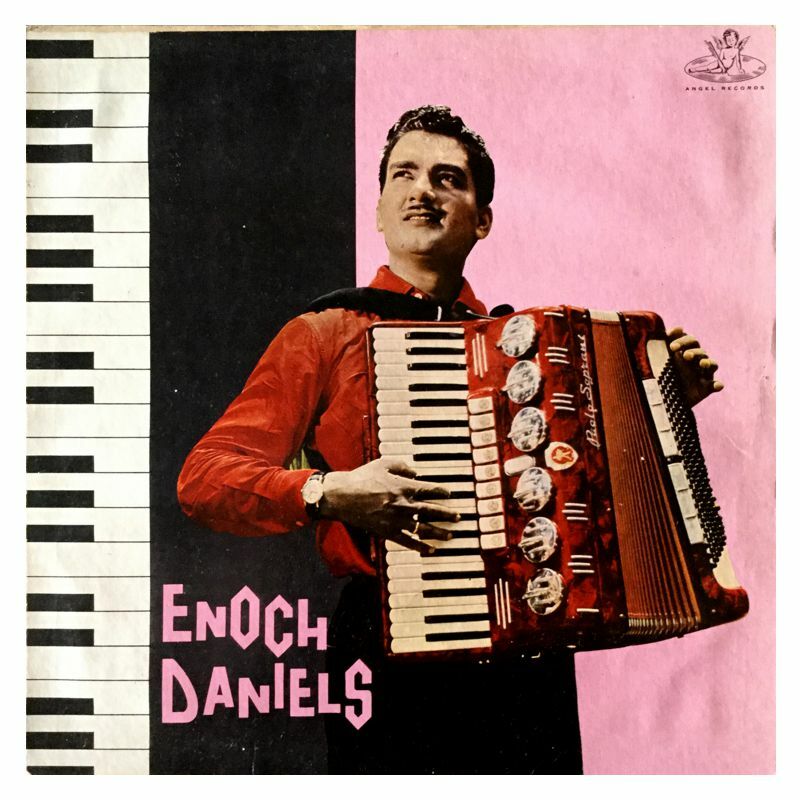 Enoch Daniels has kept the same melody without disturbing the original concept of the compositions, but, boy oh boy! Look what he's added to the melodies to make them danceable. You won't be able to stop dancing to the wild flavor of the album. 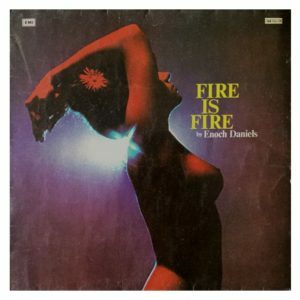 So keep your dancing shoes on, take your partner and, find out why 'Fire Is Fire' with Enoch Daniels. back to their nests, and your mind turns from work to yearned rest. Back home, as you relax, a thousand memories of the day that is done come crowding to your mind and induce a rare mood of nostalgia. 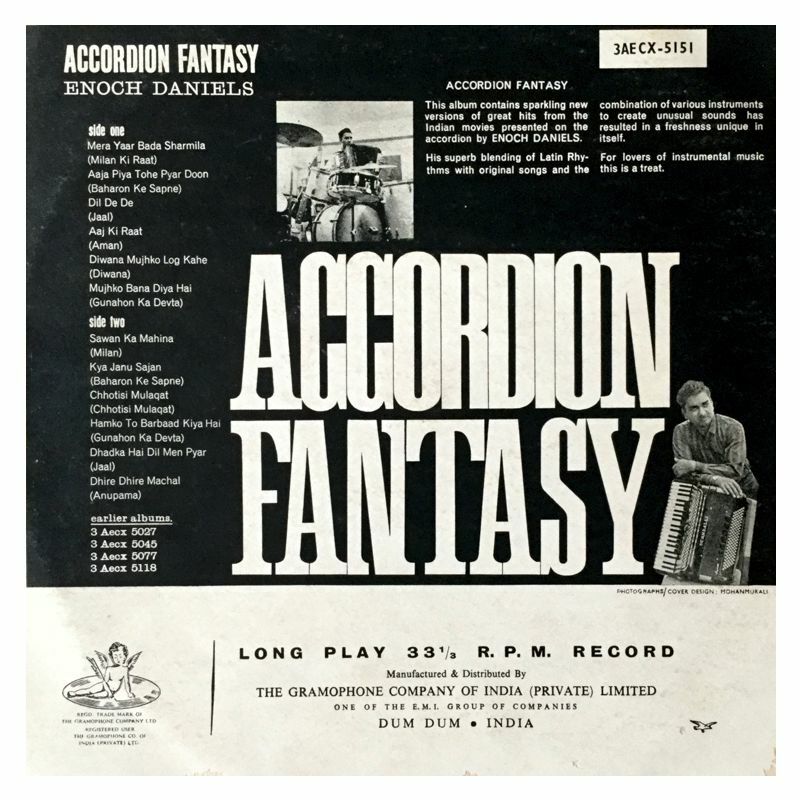 The same rare mood of nostalgia will grow on you as you relax and listen to this marvel of a disc. 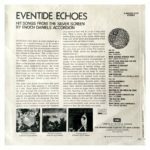 Aptly titled Eventide Echoes, the disc, through the instrumental versions of twelve great film songs, unfolds a variety of moods - ranging from the profound and poignant to the sublime and sensuous. The films that featured them belong to the past. 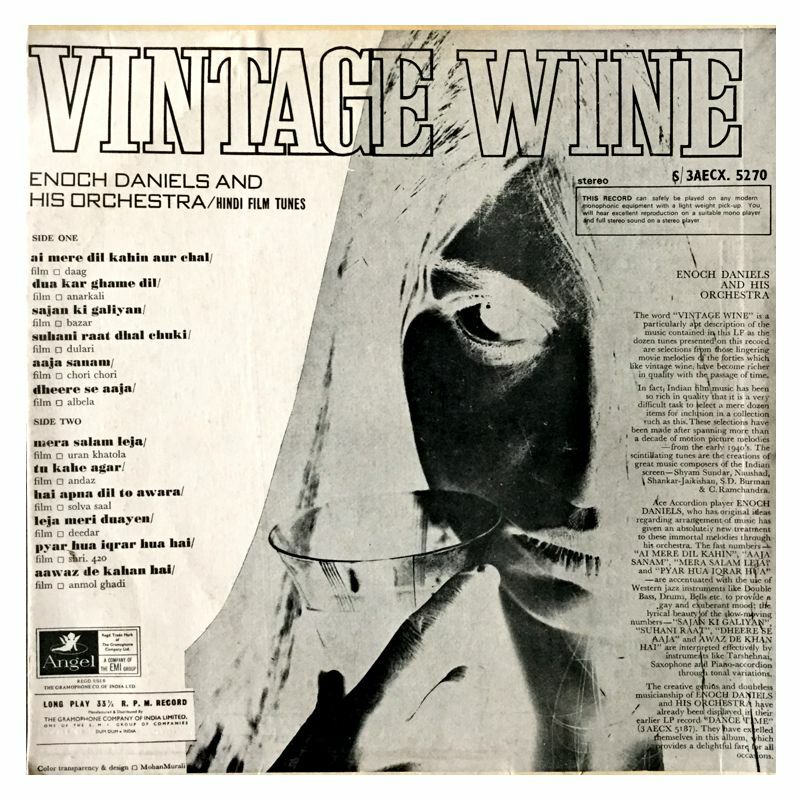 But the songs, with their sheer beauty and perennial appeal, have continued to haunt the sensitive connoisseurs - they will so for a long time. 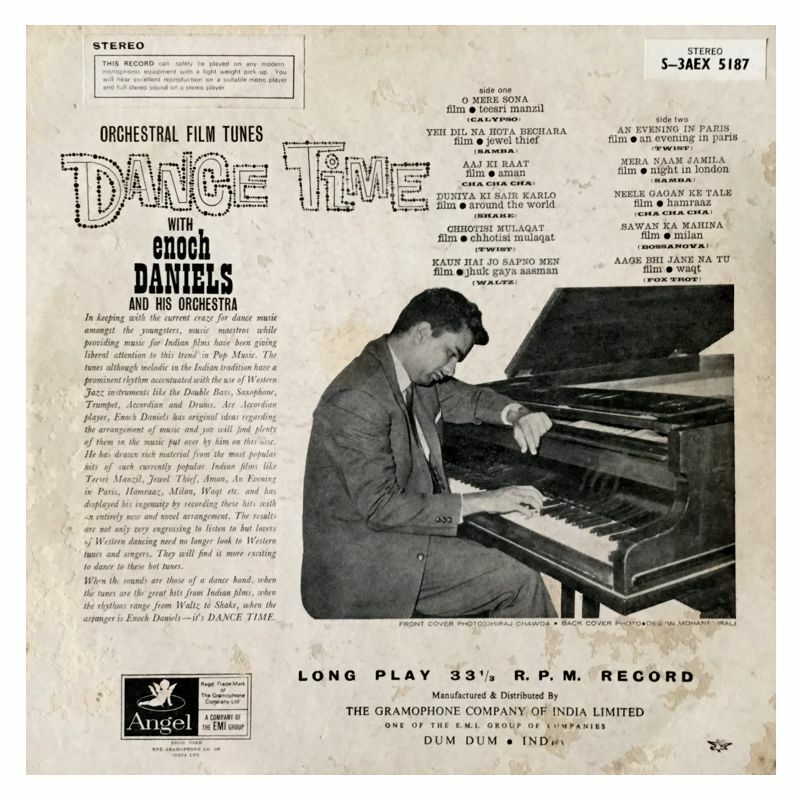 What is more, the tunes heard here reveal all the magic of the voices which sang them and all the talent and imagination of the composers who set them to music. 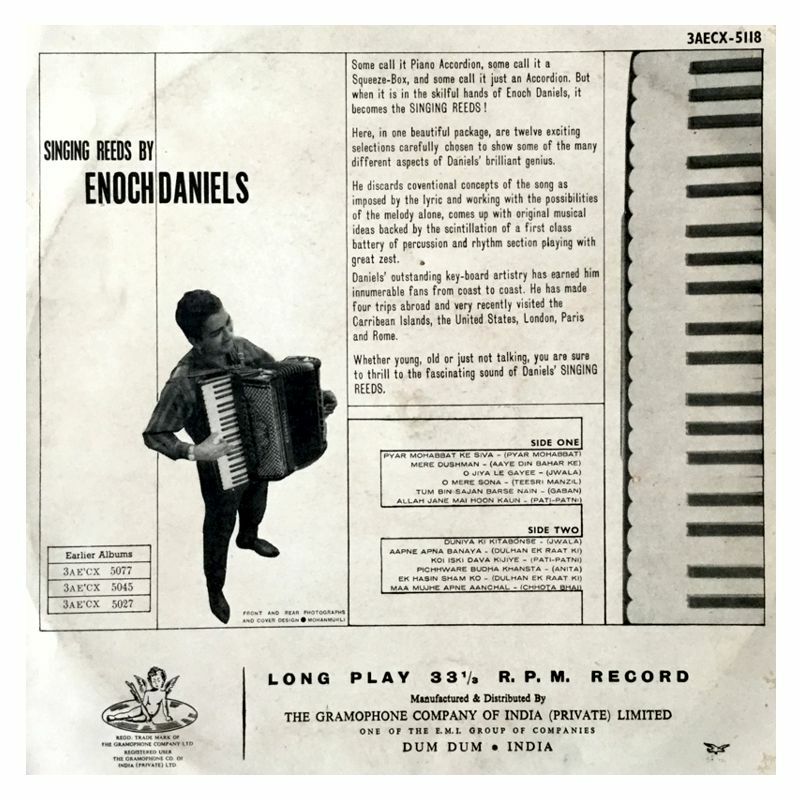 Small wonder this - because it is Enoch Daniels who has done it - and done it a second time! 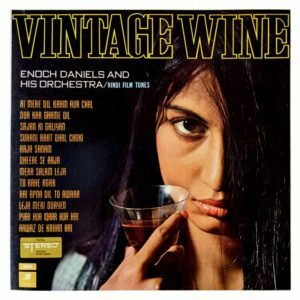 For who does not know of his first venture VINTAGE WINE, which has proved such a tremendous hit? 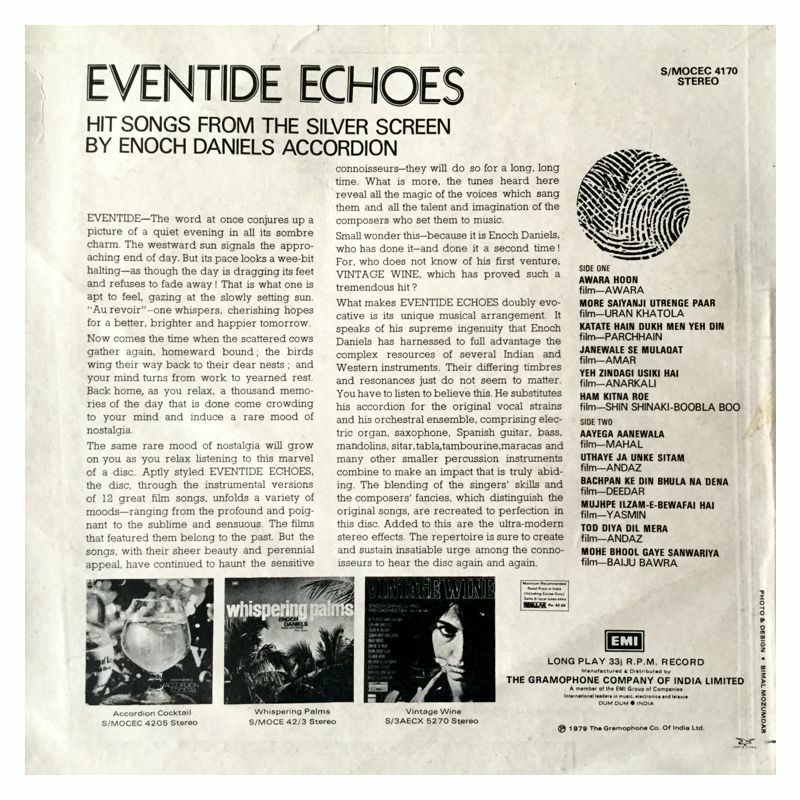 What makes Eventide Echoes doubly evocative is its unique musical arrangement. 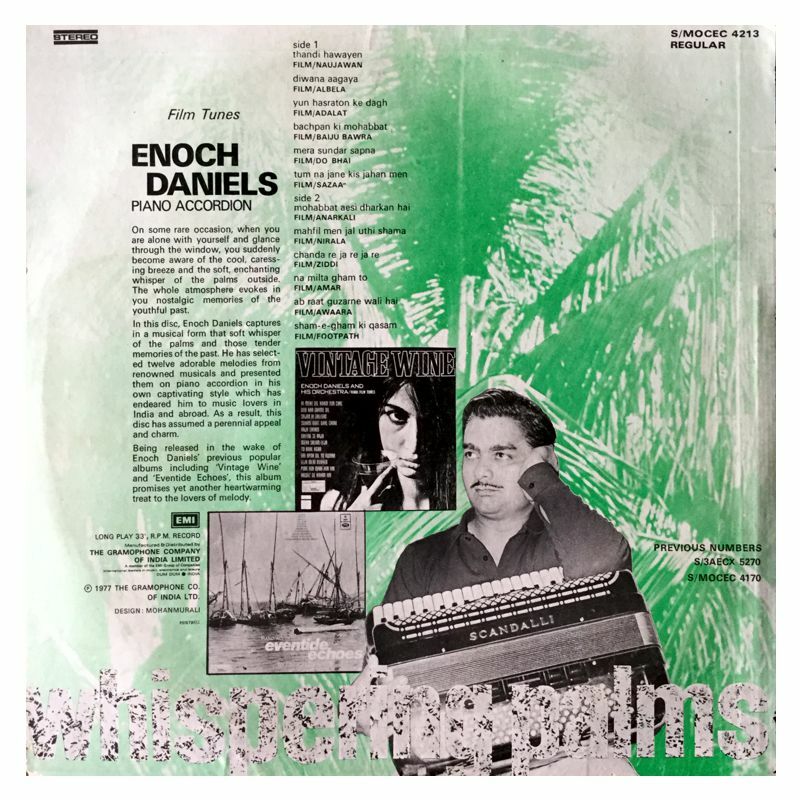 it speaks of his supreme ingenuity that Enoch Daniels has harnessed to full advantage the complex resources of several Indian and Western instruments. Their differing timbres and resonances just do not seem to matter. You have to listen to believe this. 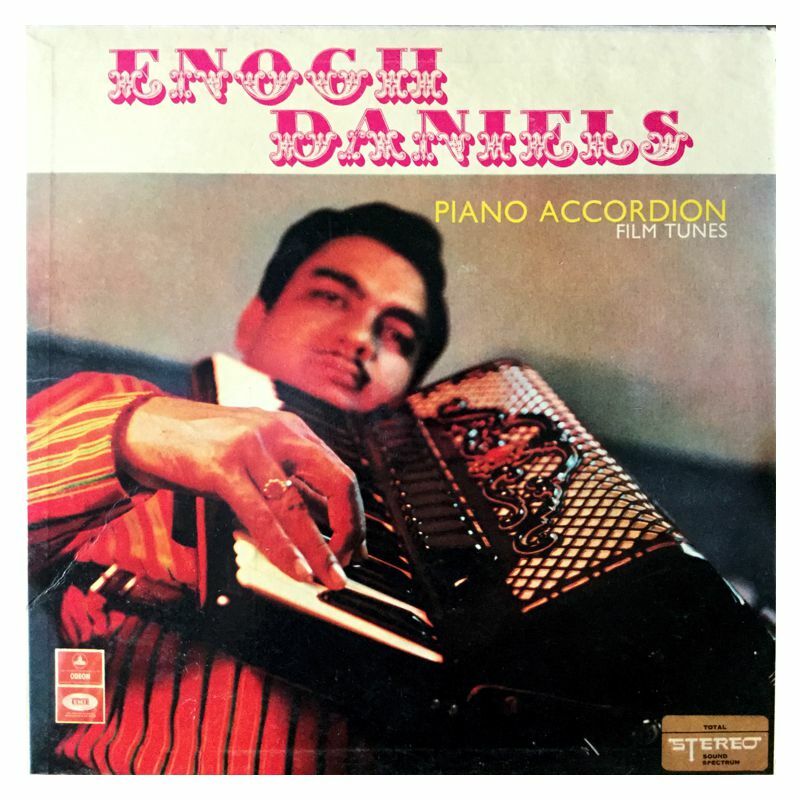 He substitutes his accordion for the original vocal strains and his orchestral ensemble comprising electric organ, Spanish guitar, bass, mandolins, sitar, tabla, tambourines, maracas and many other small percussion instruments combines to make an impact that is truly abiding. The blending of the singers skills and the composers fancies, which distinguish the original songs, are recreated to perfection in this disc. The repertoire is sure to create and sustain insatiable urge among the connoisseurs to hear the disc again and again. On some rare occasion, when you are alone with yourself and glance through the window you suddenly become aware of the cool caressing breeze and the soft, enchanting whisper of the palms outside. The whole atmosphere evokes in you the nostalgic memories of youthful past. 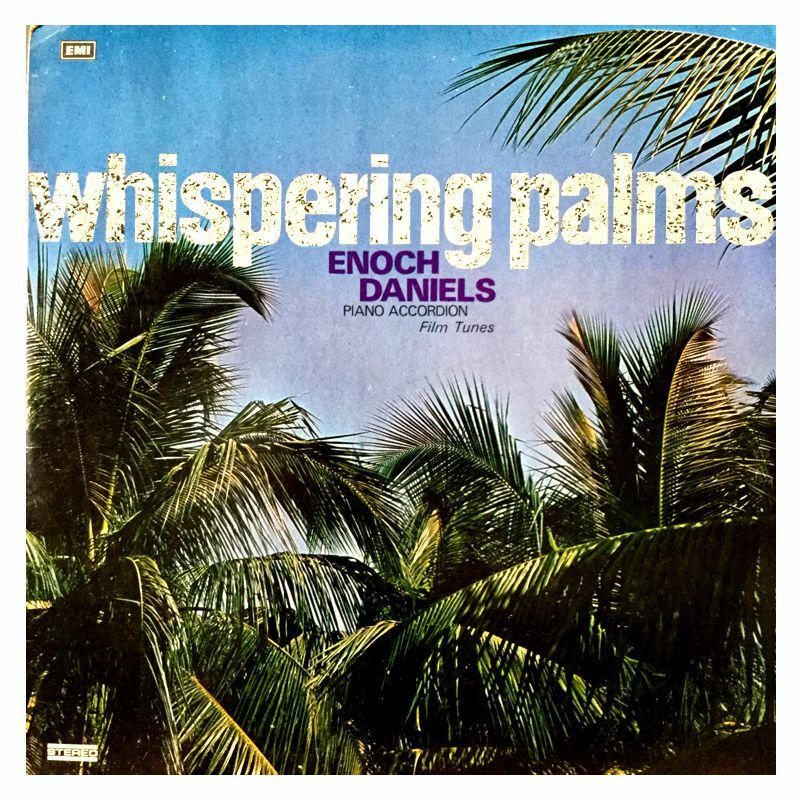 In this disc, Enoch Daniels captures in a musical form that soft whisper memories of the past. 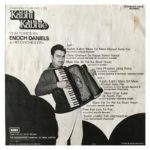 He has selected twelve adorable melodies from renowned musicals and presented them on the piano accordion in his own captivating style which has endeared him to music lovers in India and abroad. 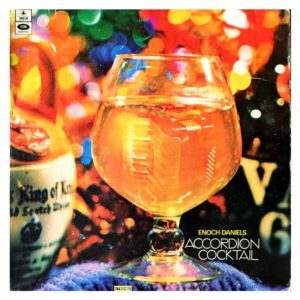 As a result, this disc has assumed a perennial appeal and charm. 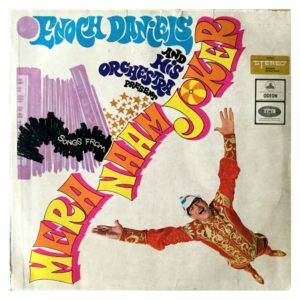 This is an unusual LP album wherein Enoch Daniels and his orchestra have presented all the great songs of R.K. films fabulous opus "Mera Naam Joker". Never before has there an instrumental version record featuring all songs from the same film, which makes this record particularly significant. 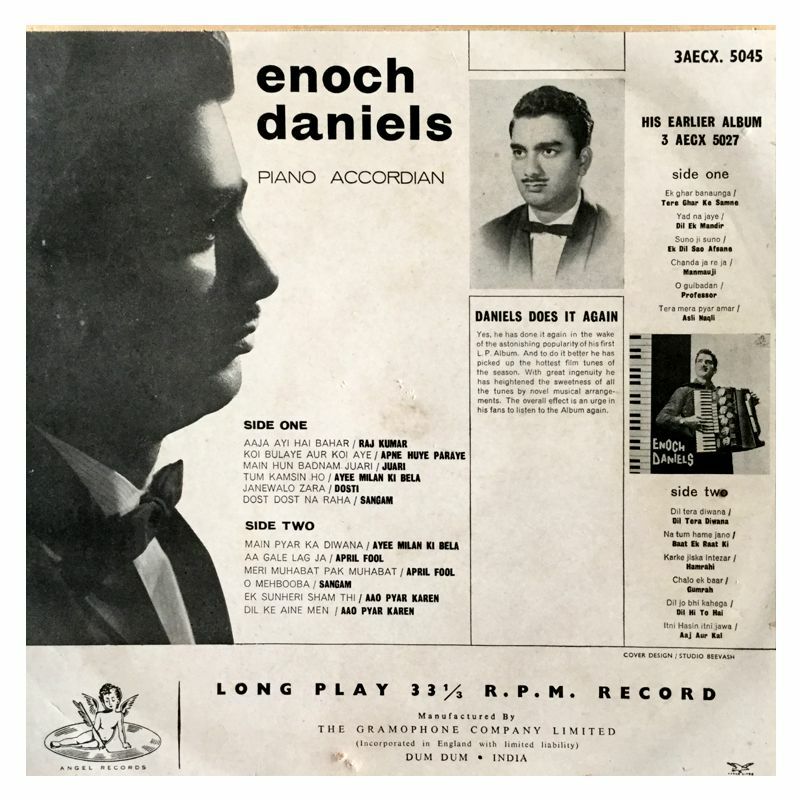 From the most sophisticated electric organ to the typically Indian classical instruments 'sarangi', many instruments have been intelligently employed to best advantage on this record by Enoch Daniels. 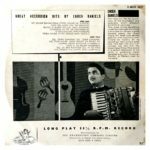 The technical advantages of ultra modern stereophonic sound recording have been fully utilized in the musical arrangements. 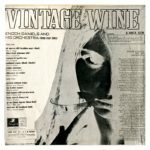 The word 'vintage wine' is a particular apt description of the music contained in this LP as the dozen tunes presented on this record are selections from those lingering movie melodies of the forties which like vintage wine have become richer in quality with the passage of time. 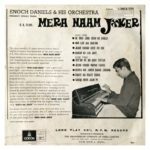 In fact, Indian film music has been so rich in quality that it is a very difficult task to select more than a dozen items for inclusion in a collection such as this. 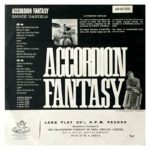 These selections have been made after spanning more than a decade of motion picture melodies from the early 40's. 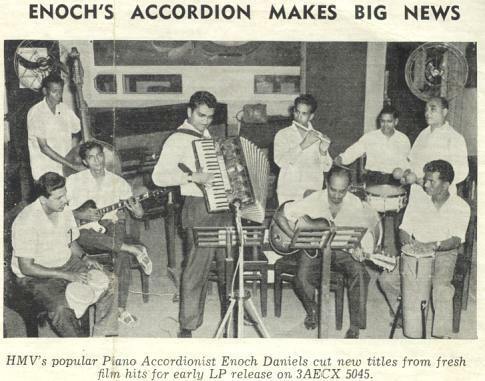 The scintillating tunes are the creations of great music composers of the Indian screen: Shyam Sundar, Naushad, Shankar-Jaikishen, S.D. Burman & C. Ramchandra. Ace accordion player Enoch Daniels, who has original ideas regarding arrangements of music has given an absolutely new treatment to these immortal melodies through his orchestra. 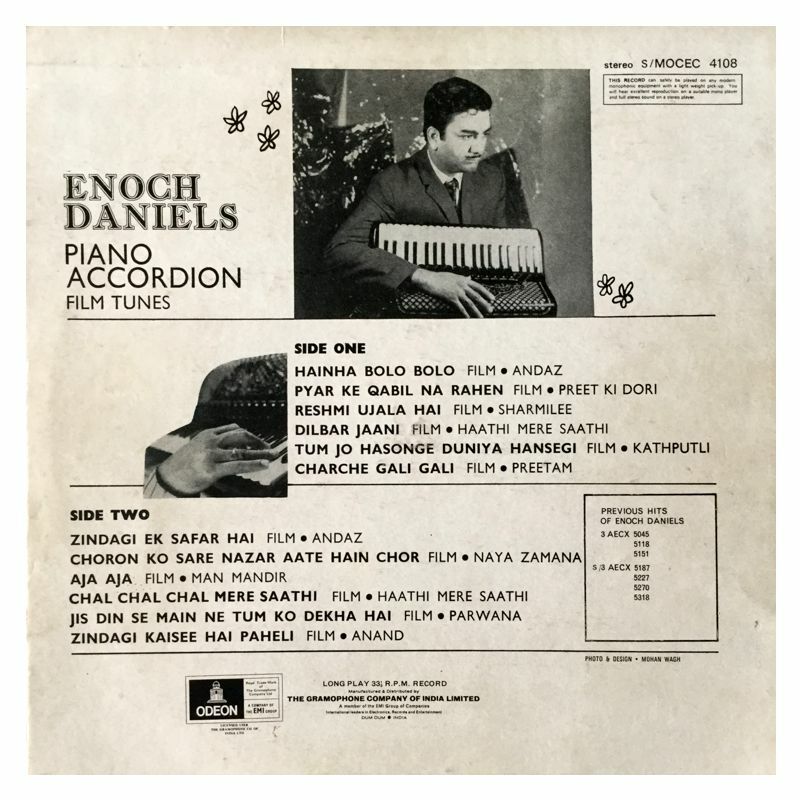 This album contains sparkling new versions of great hits from the Indian movies presented on the accordion by Enoch Daniels. 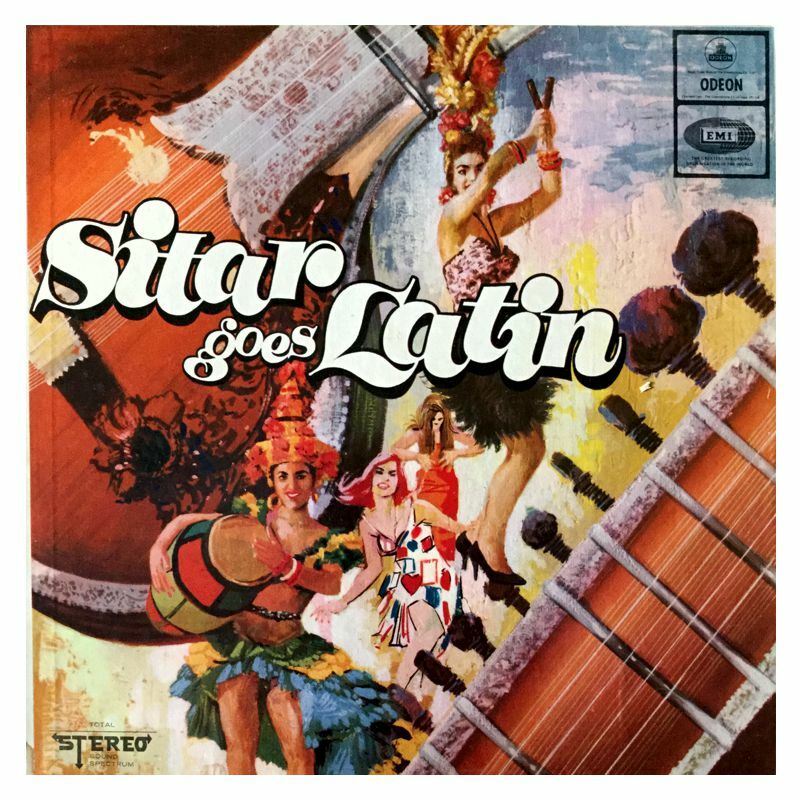 His superb blending of Latin rhythms with original songs and the combination of various instruments to create unusual sounds has resulted in a freshness unique in itself. 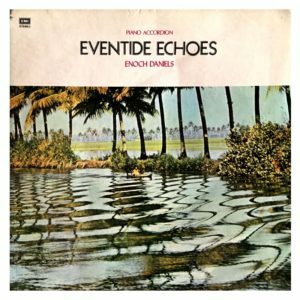 For lovers of instrumental music, this is a treat. 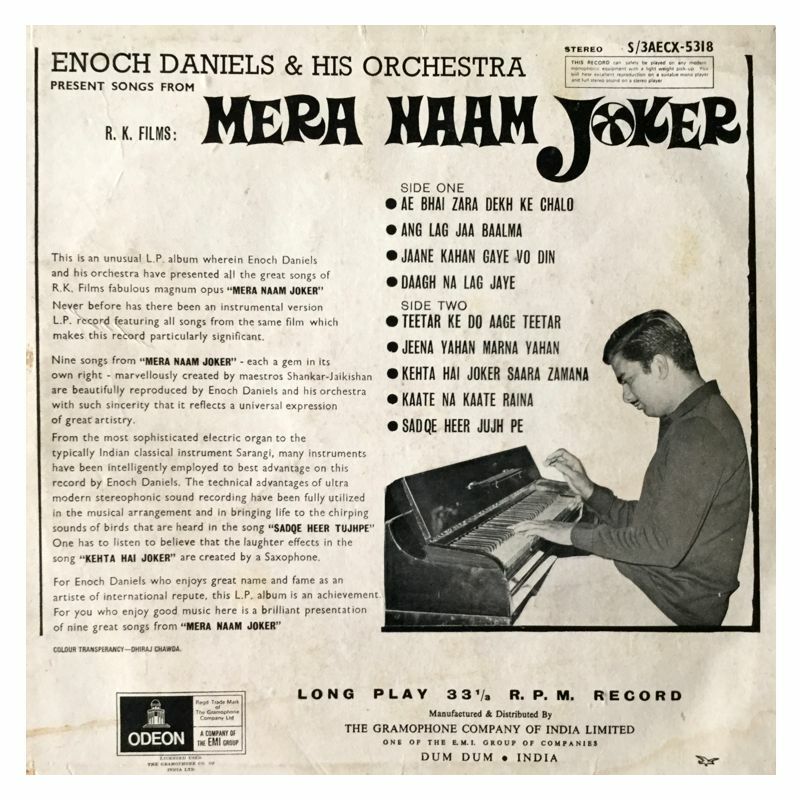 This is an unusual LP album wherein Enoch Daniels and his orchestra have presented all the great songs of R.K. films fabulous opus Mera Naam Joker. 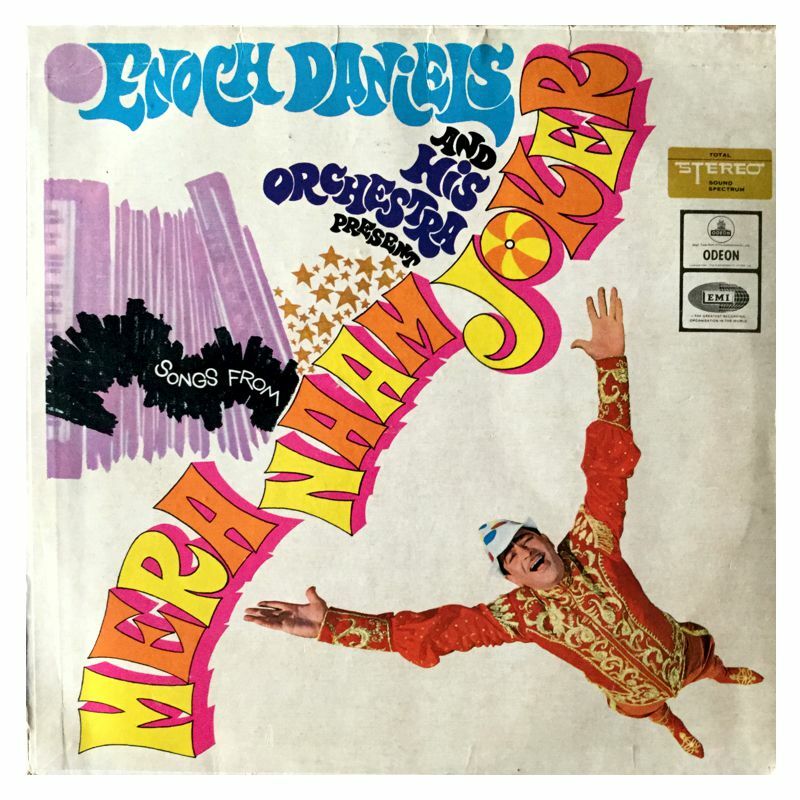 Never before has there an instrumental version record featuring all songs from the same film, which makes this record particularly significant. 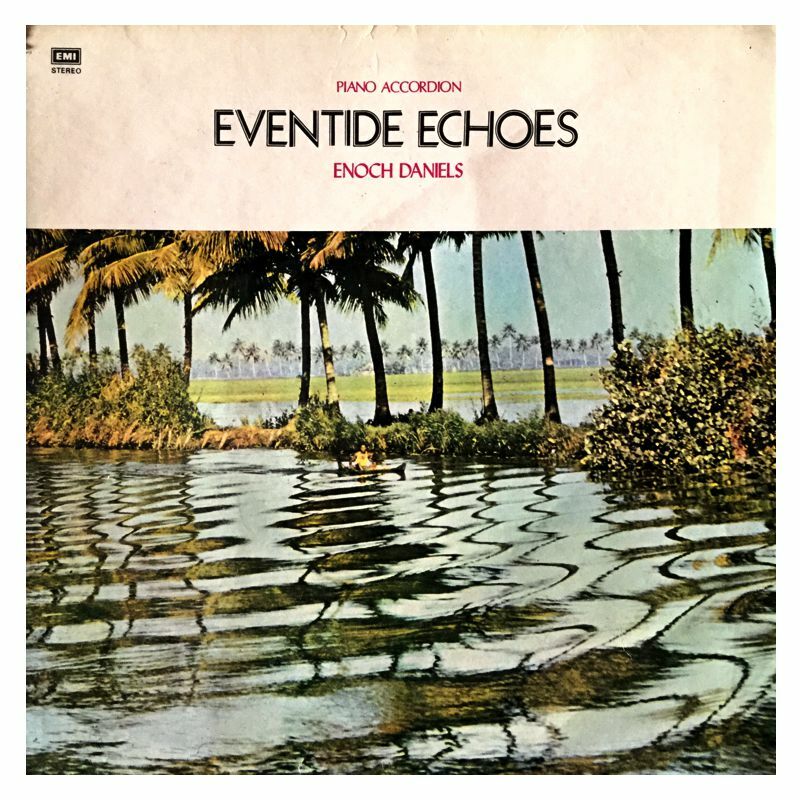 From the most sophisticated electric organ to the typically Indian classical instruments 'sarangi', many instruments have been intelligently employed to best advantage on this record by Enoch Daniels. 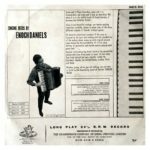 The technical advantages of ultra modern stereophonic sound recording have been fully utilized in the musical arrangements. 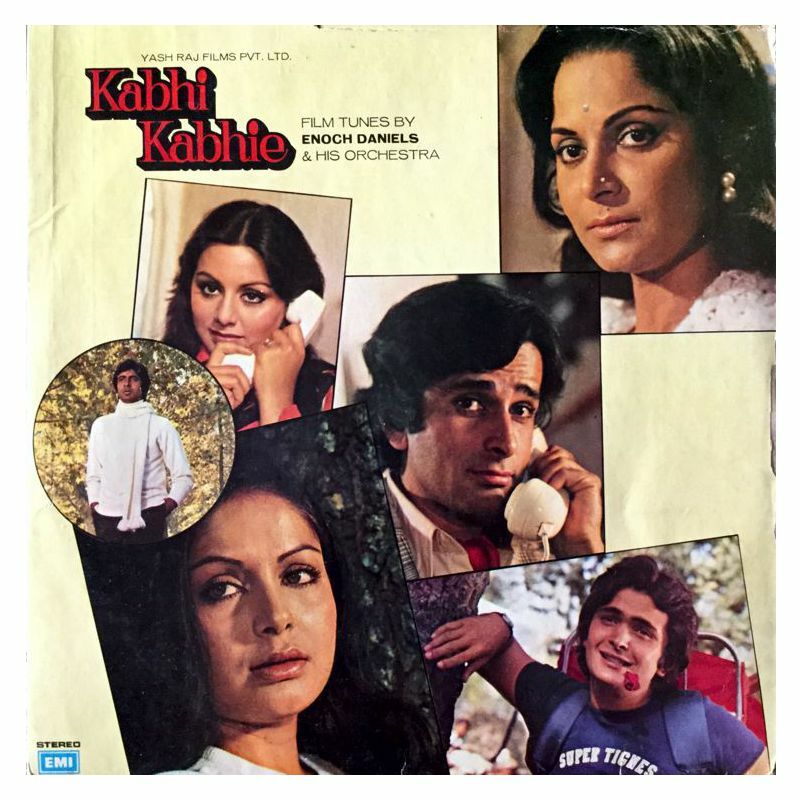 In keeping with the current craze for dance music amongst the youngsters, music maestros while providing music for Indian films have been giving liberal attention to this trend in Pop music. 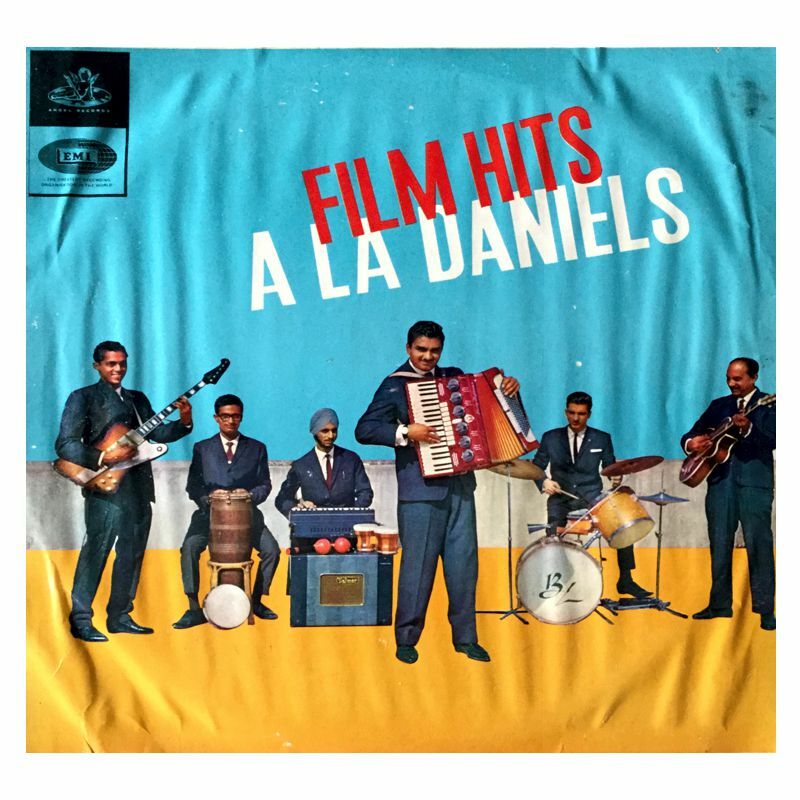 The tunes though melodic in the Indian tradition have a prominent rhythm accentuated with the use of western jazz instruments like the double bass, saxophone, trumpet, accordion and drums. 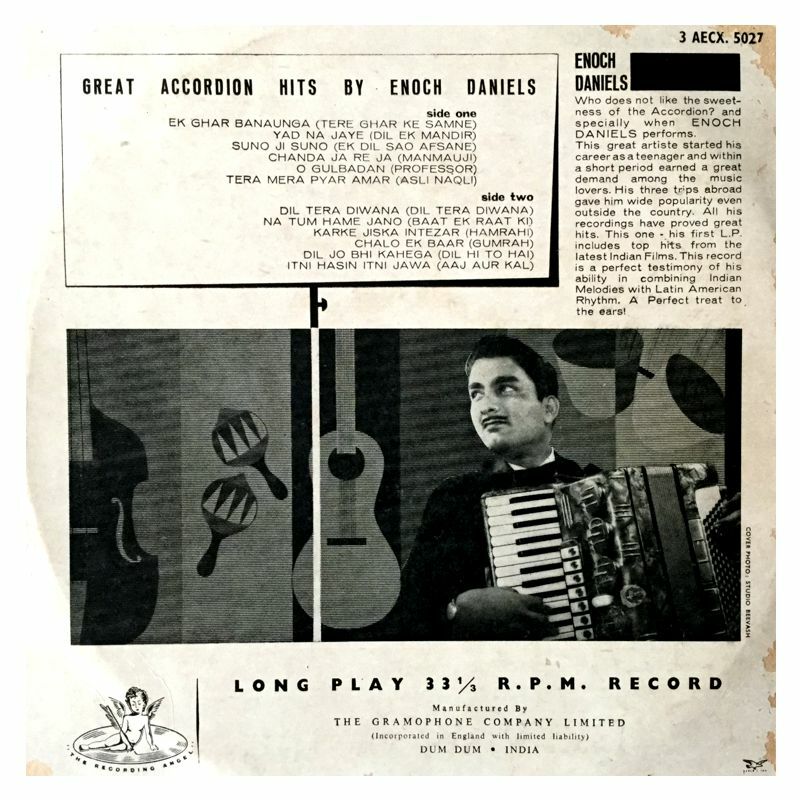 Ace accordion player, Enoch Daniels has original ideas regarding the arrangement of music and you will find plenty of them in the music put over by him on this disc. 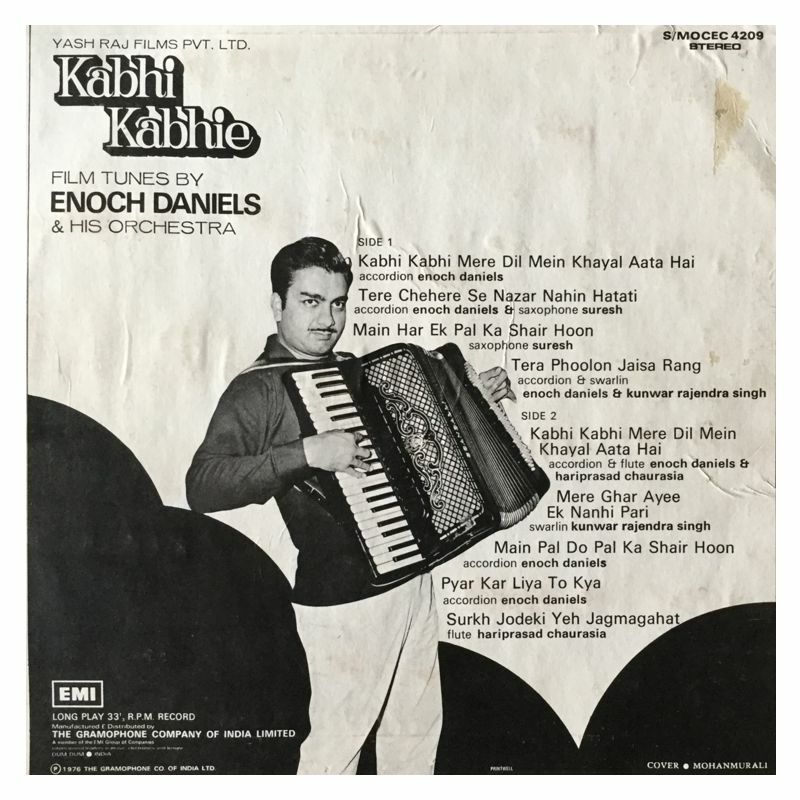 He has drawn rich material from the most popular films, and the results are not only very engrossing to listen to but lovers of Western dancing need no longer look to Western tunes and singers. They will find it more exciting to dance to these new hot tunes. These days when classical music of India has been "discovered" by the West, continues to gain tremendous popularity in that part of the world, is being used by various Pop groups and has become a subject of study by jazz musicians, we take great pleasure in presenting twelve world-famous Latin numbers on the sitar. Through this ancient instrument of India, these favorites from the West have acquired a unique colour. The original Latin flavor of these numbers has been maintained on the presentation. 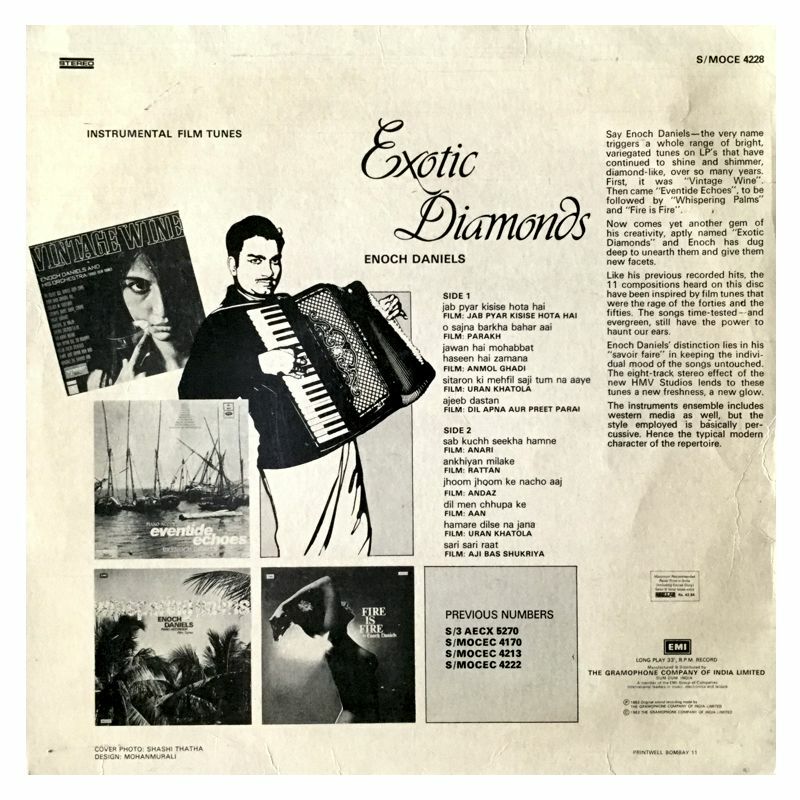 A touch of Eastern melody emanating from the delicate strings of the sitar lends a mysterious and irresistible quality to these perennial favourites. 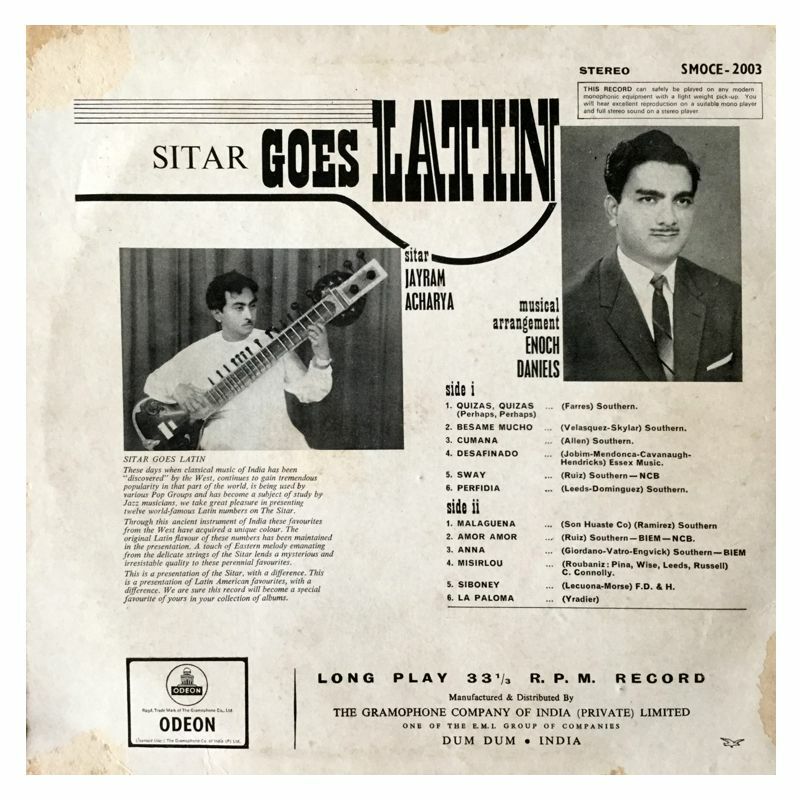 This is a presentation of the Sitar with a difference. This is a presentation of Latin American favourites, with a difference. 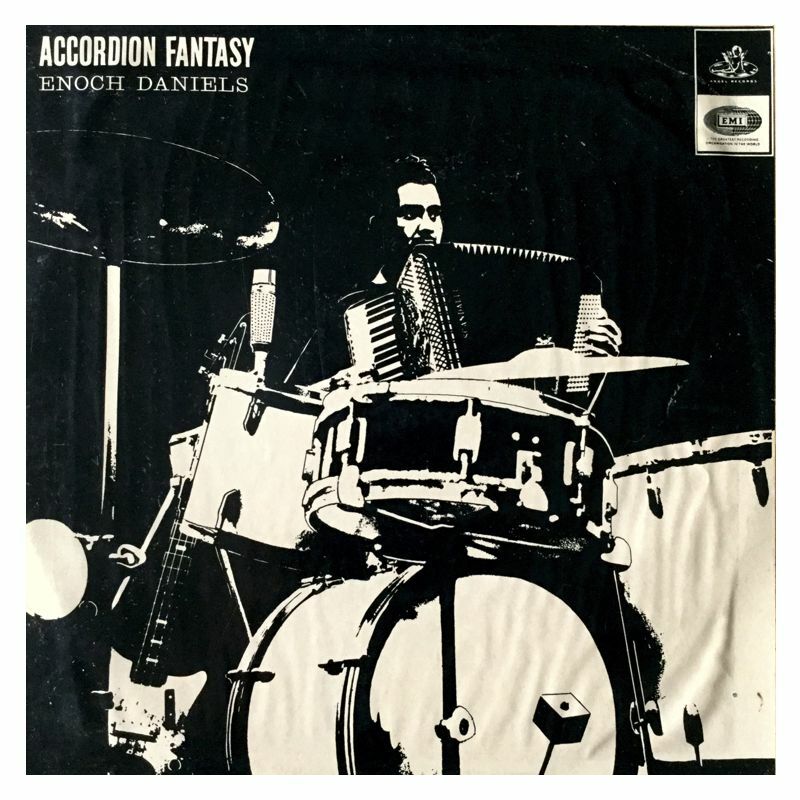 We are sure this record will become a special favourite of your in your collection of albums. Some call it a Piano Accordion, some call it a Squeeze-box, and some call it just an Accordion. 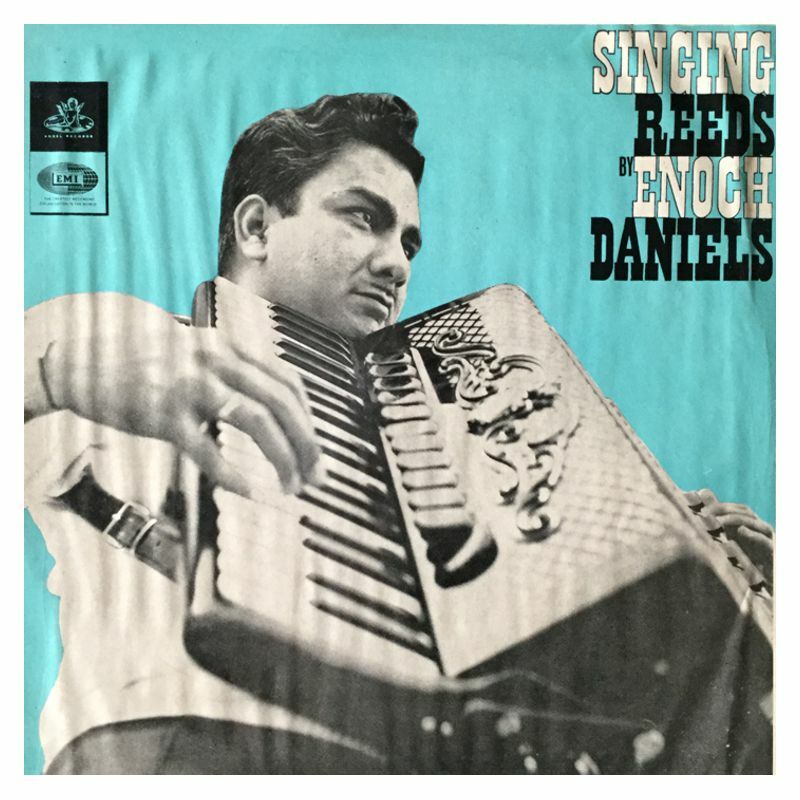 But when it is in the skillful hands of Enoch Daniels, it becomes the Singing Reeds! 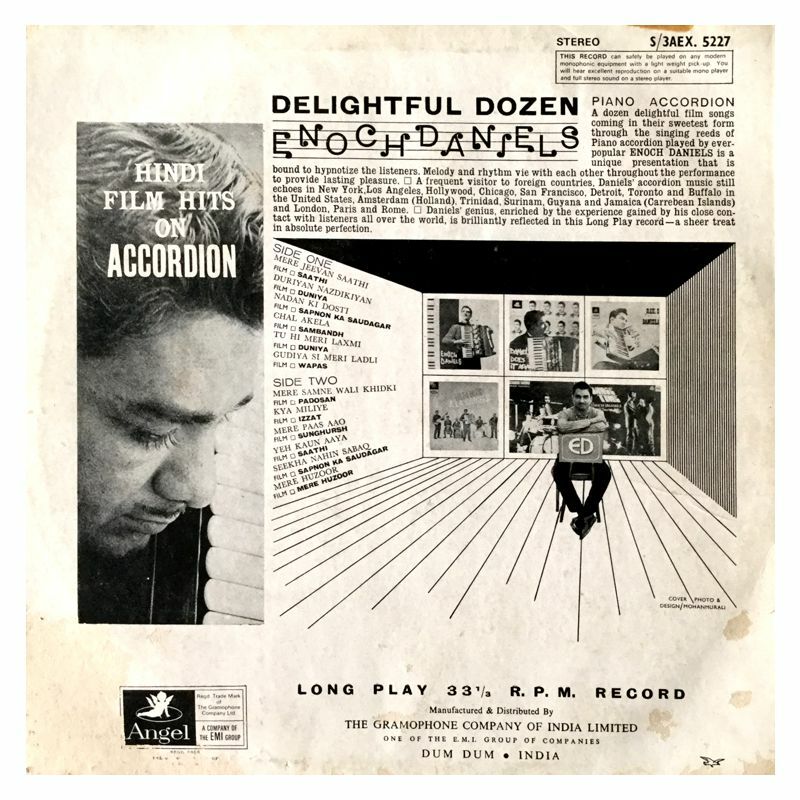 Here, in one beautiful package, are twelve exciting selections carefully chosen to show some of the many different aspects of Daniels' brilliant genius. 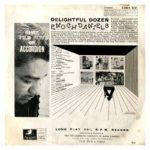 He discards conventional concepts of the song as imposed by the lyric and working with the possibilities of the melody alone, come up with original musical ideas backed by the scintillation of a first class battery of percussion and rhythm section playing with great zest. 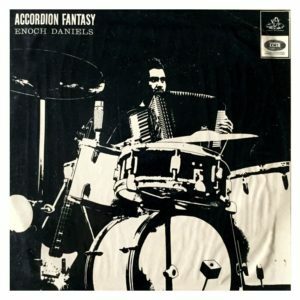 Daniels' outstanding keyboard artistry has earned him innumerable fans from coast to coast. He has made four trips abroad and very recently visited the Caribbean Islands, the US, London, Paris & Rome. 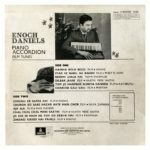 A dozen delightful film songs coming in their sweetest form through the singing reeds of Piano Accordion played by ever-popular Enoch Daniels is a unique presentation that is bound to hypnotize the listeners, Melody and rhythm vie with each other throughout the performance to provide lasting pleasure. 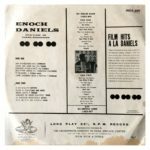 Daniels' genius enriched by the experience gained by his close contact with listeners all over the world is brilliantly reflected in this Long Play record - a sheer treat in absolute perfection. 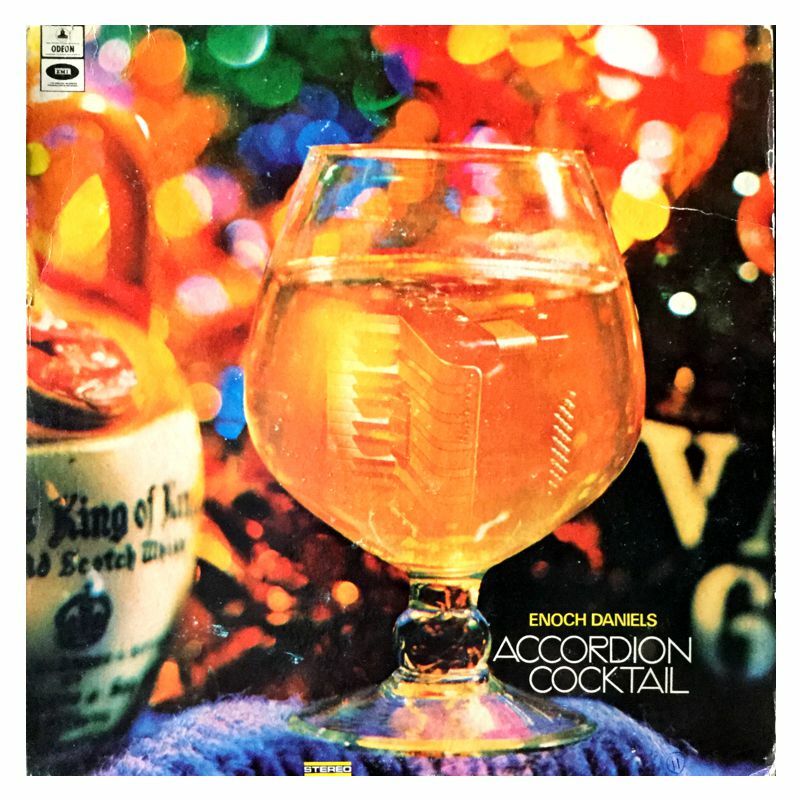 Take a hit parading song, peel it down to the essential melody, vitalize it with the verve of the Latin American rhythm and the robustness of jazz and refashion it to make you sway - that is what Enoch Daniels has been doing in his own trade-secret way with consistent success record after record. 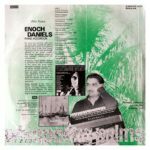 The reason why he has no equal in doing so, is the there is no other Enoch Daniels! 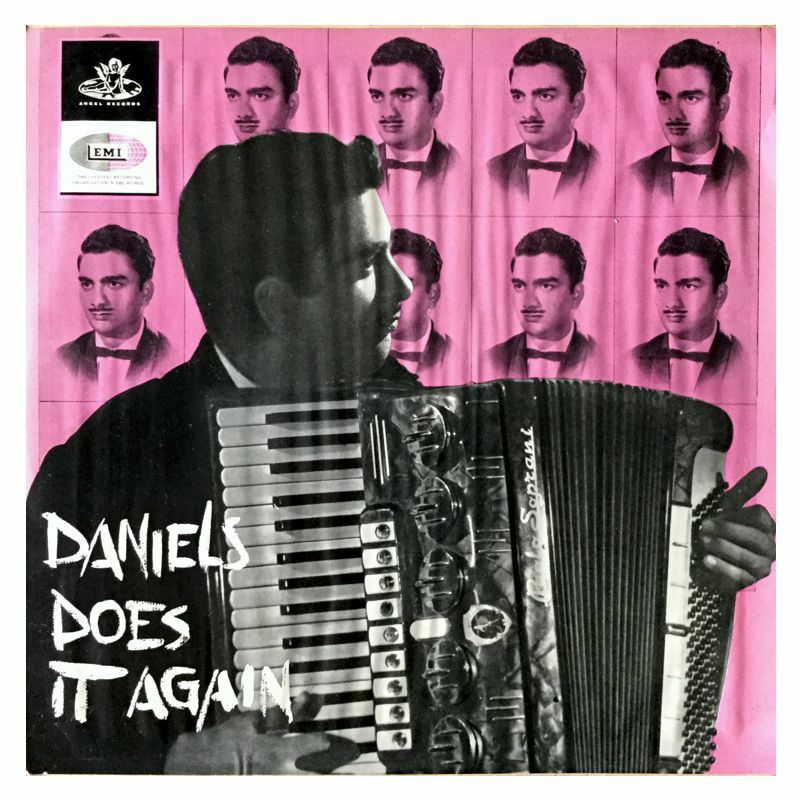 This is Daniels' third LP and, as before, he presents twelve top numbers from films and alchemizes them into melodies of romance and rhythm. 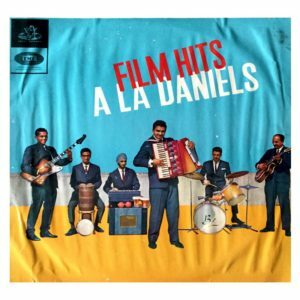 This album contains sparkling new versions of great hits from the Indian movies presented on the accordion by Enoch Daniels. 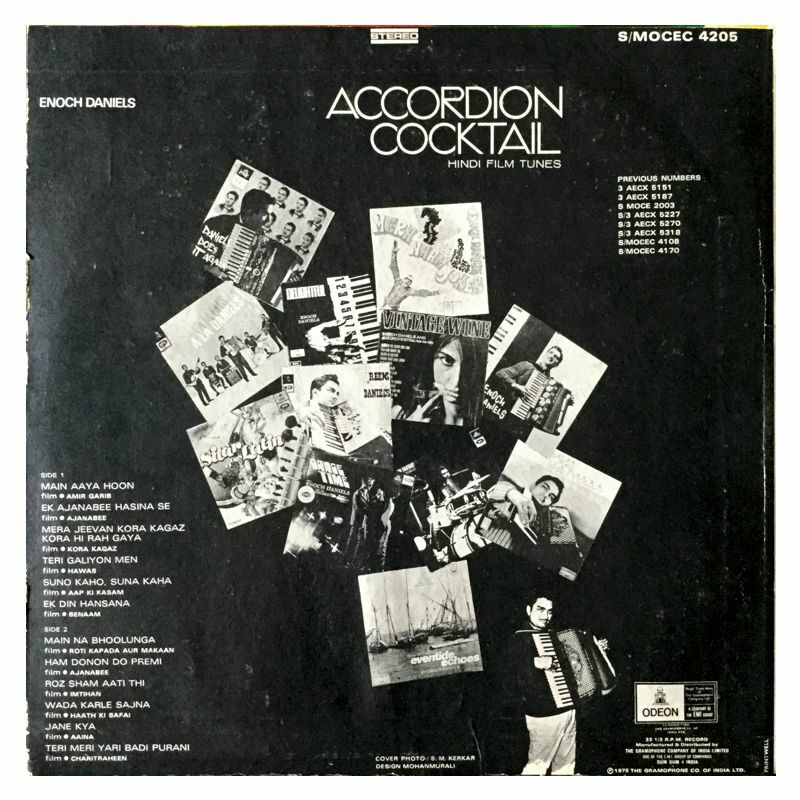 His superb blending of Latin rhythms with original songs and the combination of various instruments to create unusual sounds has resulted in a freshness unique in itself. For lovers of instrumental music, this is treat. 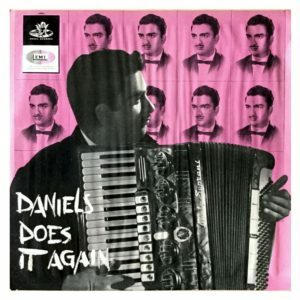 Who does not like the sweetness of the Accordion? 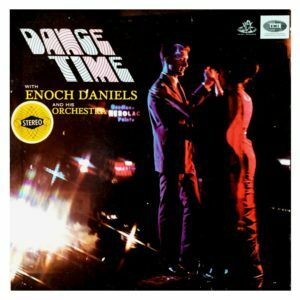 And especially when Enoch Daniels performs. This great artiste started his career as a teenager and within a short period earned a great reputation among music lovers. His three trips abroad gave him wide popularity even outside the country. All his recordings have proved great hits. This one - his first LP includes top hits from the latest Indian films. 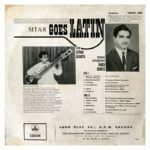 This record is a perfect testimony of his ability in combining Indian melodies with Latin American rhythm. A perfect treat to the ears.